After my earlier moan about adoption celebration days I am pleased to confess we had quite a remarkable day today in court. Like many pre planned days out our day started two, or three, weeks earlier. Lotty, knowing a special occasion was nearing, had become fixated on dresses, shoes and hairstyles. Flossy did not feel the same. Mrs C was consumed with finding clothes that met the exacting criteria that meant Flossy would not freak out. A very exact criteria that also ensured that she would not be mistaken for a boy, which upsets everyone, but also are in a very limited way not girly. No mean feat. Anxiety has risen in the ranks, though Peanut is oblivious, and late nights and early mornings have ensued. So, this morning, children spring out of bed and little ones are jet washed in turn. 25 minutes prior to leaving, Ginger appears from his pit and requests assistance. Though he could care less he understands that Mrs C and the Big one will give him a tongue lashing if dressed inappropriately. I put on my suit and the shoes I bought when we went to court with the first three. The Big One, only 7 at the time, insisted I buy a suit and shoes, she has clear opinions about these things. So, long story short and after a tense moment over seating arrangements, two car loads of us arrive at court. Social workers are absent but we crack on. The usher gives us a look and says "There's quite a few of you I think we'll use the courtroom, is that ok?" a resounding "yes" was the reply. Result. She looks again and asks "Would you like the judge to wear their robes?" again "yes". Result. She looked again, suspiciously, and asks "Have I seen you before? one more time "yes" and we tell the tale of our previous visit. So, in we go and the the moment is appropriate, photo's are taken, polite chit chat is made. Flossy and Lotty's eyes are on stalks, they're giddy and become slightly overexcited but well within the realm of manageable. Ginger is cool, Peanut is not bothered, the big one is very pleased, grandma is proud, Queenie feels family and adoptive dad is quietly emotional. But, Mrs C is having a feeling. 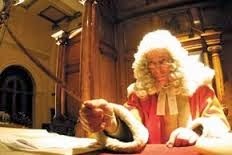 The judge who 8 years ago signed the court orders to bring the children into care, who sniffed a rat and included the, as then unborn, Lotty, though the SW's hadn't. Mrs C has a quick word and this is the judge. After all these years we stand here at the end of the story, or at least the end of this episode. The kids enjoyed the day and will hopefully remember it. The seriousness, the spectacle, the special access will all live long in their memories and make sense of their own journeys. But for Mrs C and I it was a blessing to meet the one of the most influential players in three of our children's lives. A professional who's actions had impacted so significantly in their all their lives but so critically in Lotty's life. Often as an adoptive parent we have missed some of the most significant events of our children's lives and have not been present for decisions that will have lasting consequences for them. Even to just meet a key player in those decisions, albeit briefly, holds a significance for us and adds colour into the grey areas of my children's lives. Today we certainly got a day in court that we could never have dreamt of. Congratulations! And wow - amazing that you had the same judge! I have to say we could hardly believe it when we heard the name. It kind of bookends the whole deal. I had a great image, from your writing, of you all in that courtroom. Then for it to be the same judge, well it just makes it a little more sense of it all. The Judge was a bit wide eyed when she said you can sit in the "big chair" and flossy, Lotty and Peanut cast off their inhibitions, if you know what I mean.